It’s beginning to look a lot like…an abbreviated ice fishing season in NW Pennsylvania. With a shot of really cold air at Thanksgiving, area lakes skimmed over early and many hole sitters were anticipating safe ice within a week or two. But rain and warm temperatures wiped out the ice cover. Christmas and New Years passed without ice forming. However, I am confident anglers will be drilling holes by the first of February. One individual anxiously awaiting safe ice is Dave Lefebre of Erie, Pennsylvania. 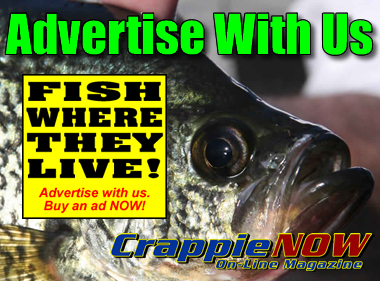 Although Lefebre is a professional bass angler by trade, he is a crappie fisherman at heart. He looks forward to ice fishing each winter during down time from the pro bass tours. 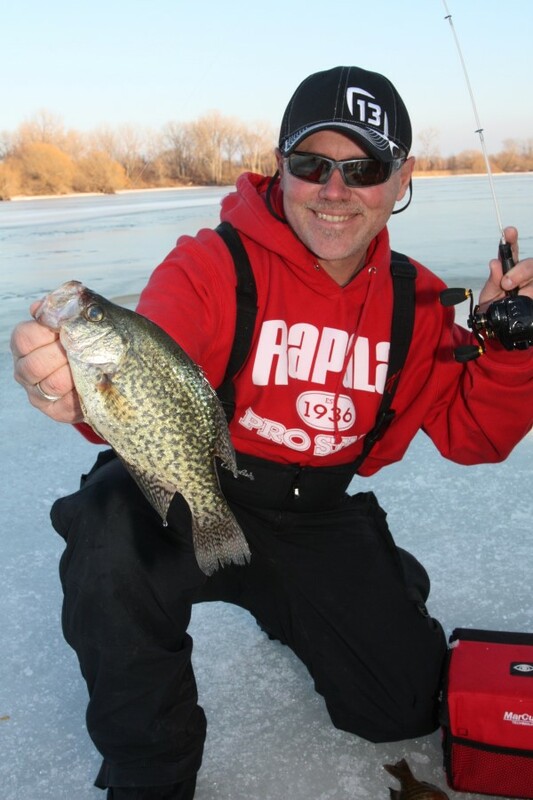 While Lefebre was taking a break from gear preparation, I prodded him to offer several specific tips to help you ice more crappies. Choosing the right bait for the mood of the crappie. 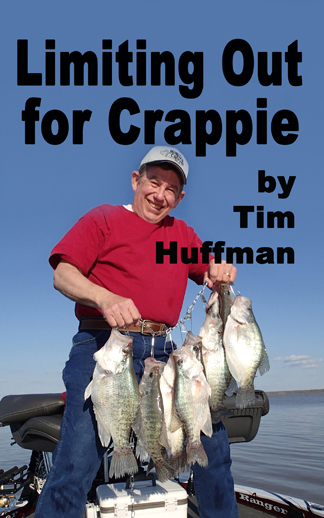 A simple selection of tubes is good for finessing a crappie to hit. 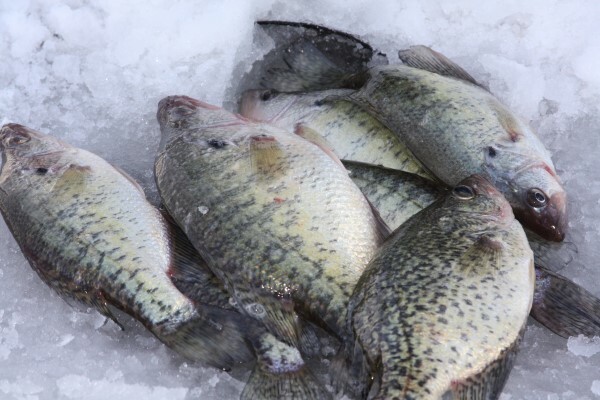 Lefebre has narrowed his selection of baits for crappies to two specific categories – one style of lure for active feeding crappies and one lure for non-aggressive fish. “For active crappies I choose flashy vibrating style bait – either a traditional Rapala Jigging Rap or Rapala Slab Rap which is a mini lipless vibration crankbait,” explains Lefebre. 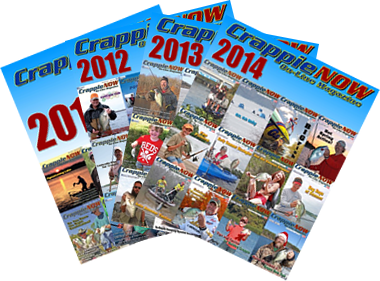 “These baits drop quickly to crappies I initially spy on the sonar at each hole I check. I’ll jig these lures to draw strikes from eager biters. Typically, I’ll catch two or three with these lures before the fish shut down.” If you don’t have either of these baits, a small ¼-ounce blade bait or slab jigging spoon will work. Next Lefebre goes to teasing remaining crappies with a finesse presentation to garner a few more crappies before the pack moves. For this presentation he uses a 1 or 1.5-inch micro tube on a 1/64 or 1/32-ounce jighead. Now your skill with reading the flasher comes into play as you must first attract and then tease a crappie to commit to the jig with some fancy up and down moves. Color choice also comes into play when finessing the reluctant biters typically starting with minnow-like colors if water is clear and bolder colors if water is dingy. 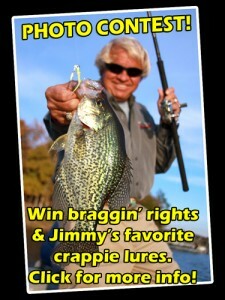 The catch of crappies from one hole – some taken on flashy jigging baits, and some taken by finessing tiny tubes. 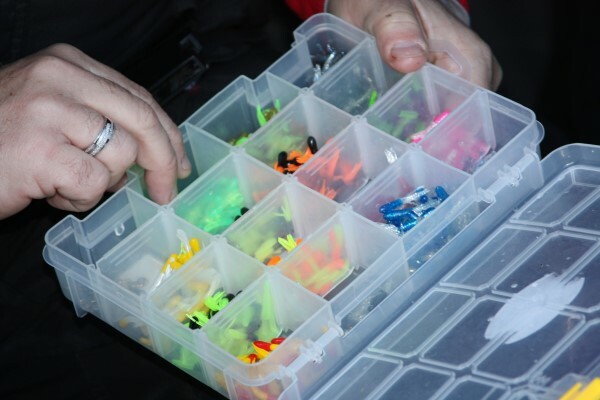 Keeping baits horizontal during presentation is critical according to Lefebre. He ties a keeper knot on the line tie of each lure and jighead to prevent the main line knot from sliding forward on the bait, resulting in a nose up posture. During down time at home, he ties the keeper knot on the line-tie of each bait and clips it close to the knot. Then he then adds a small drop of glue to hold it in place. Lefebre has been using small spool spinning reels on his ice rods for a number of years, but he was not satisfied with the performance. He desired something simpler. “When I tried the 13 Fishing Free-Fall Ghost recently, I realized this was what I had been looking for. It’s sort of like a baitcaster in complete free-spool – no drag on the line coming off the rotating spool. There is a brake you can apply with one finger to stop the line. I can drop a 1/64-ounce jig with this rod.” He combines the Free-Fall Ghost with the Fishing 13 super soft action Pickle Stick for what he considers the perfect crappie ice-fishing combo.